Long before DUMBO became home to yuppies and became Eloi-ized, with its carousels and gourmet chocolate shoppe purveyors, it was one of Brooklyn’s hardest-working neighborhoods, with coffee and grocery importers, warehousing, cold storage, and corrugated box factories, for block after block. Many of the businesses were linked by the Jay Street Connecting Railroad, whose tracks are today called “trolley tracks” by area newbies. 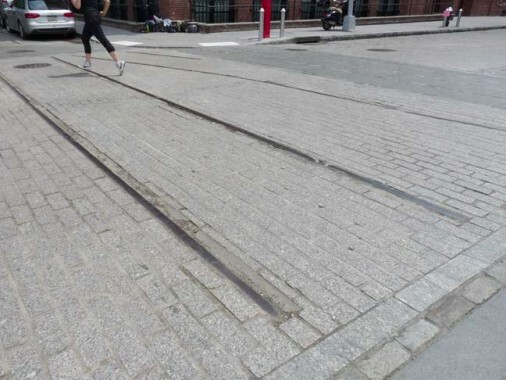 The tracks were inlaid in brick streets that apparently had been pioneered in Belgium. 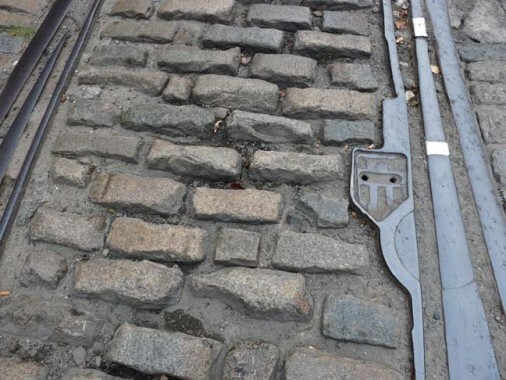 Bricks like these were the primary form of street paving in NYC before macadam and blacktop replaced them, and whenever a street is reconstructed you can sometimes spot them underneath several layers of pavement. Under the Bloomberg administration and Department of Transportation chief Janette Sadik-Khan, the city has become uncomfortable with certain areas of Belgian-blocked streets, especially uneven stretches of them that cause bicycle riders, walkers and even auto axles problems. DUMBO is just such an area. 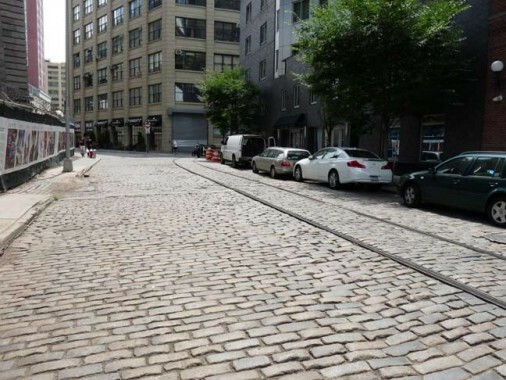 Plymouth Street is the northernmost east-west through street in DUMBO and its Belgian blocks surrounding the JSCR tracks are especially uneven, as the concrete between the bricks has worn down. 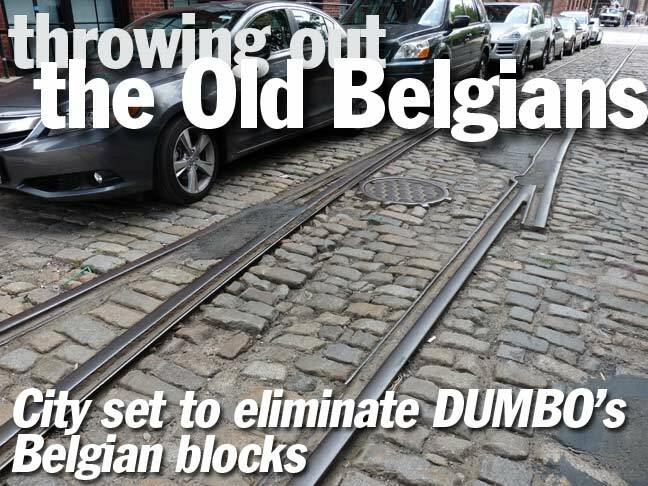 The city has proposed to place evened-out faux Belgians that are more friendly to the extra traffic that has come up as DUMBO became a residential neighborhood. 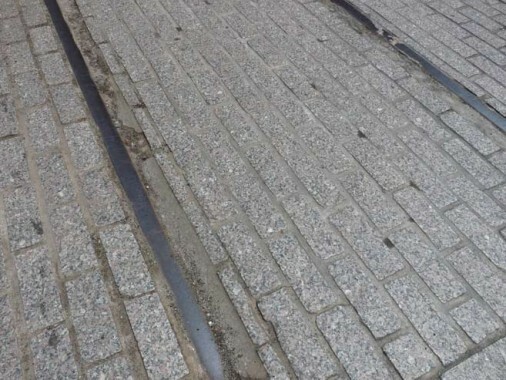 A close-up view of a more uneven section of Belgian blocks and tracks. Though the city is soliciting opinion on the faux bricks, make no mistake, the replacement is almost a done deal. Adams and Plymouth Streets under the Manhattan Bridge. The Belgian blocks have remained for over a century because the city never got around to blacktopping the streets, which were mostly deserted for several years as the factories and warehouses gradually left and the neighborhood was slowly repopulated. Adams Street’s Belgians are more evenly paved. Are they on their way out, too? When I visited Baltimore’s Fell’s Point in the 1990s the brick streets reminded me of DUMBO. Will their character and history be replaced by anodyne fake bricks? It sure looks like it. Belgian blocks are better than speedbumps at slowing vehicle speed. Leave them alone if you value life and limb. I’ve live in rural north Texas most of my life. When my paternal grandfather was young, one of the jobs he had was paving roads with brick. When I was young, I remember him telling me that Gainesville, Tx was one of the towns he worked. There are still a few streets with these bricks. When I am in the area and I drive down one of those streets it does bring back memories. As you say, they do add character and charm. They should not be removed! It adds so much character and charm to the streets! It would be such a shame to remove it. 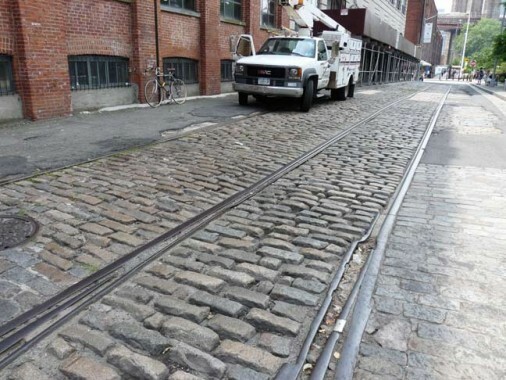 What about the bikes that can’t travel on these cobblestones? You want them to ride on the sidewalk or something? Relax. There are plenty of places for the hipsters to ride. The city does not have to surrender to the bicycle. When I lived in the Brooklyn Navy Yard in the mid eighties while my ship was in the yards there was no one around to trip over the rails and Belgian Blocks. Now all the Carrie’s and the cupcake brigade have trouble navigating the streets. Welcome to Noo Yawk b****. It isn’t supposed to be easy, if it was you would still be in Milwaukee. Man, I’m starting to sound like Jeremiah. Oh, and by the way Fell’s Point is a b**** to navigate in when you have a snoot full. Where is the neighborhood folks on this? They need to voice their opposition! It’s my understanding that the winning proposal (there were two different mockups on view in Brooklyn Bridge Park a few weeks ago–the one reusing the exisiting blocks with a granite strip added for bikers was the overwhelming choice of those that viewed the mockups, the other using artificially weathered new blocks) is the better choice when the streets are redone in the next year or two–its not a matter of “getting rid” of the Belgian Block, but with the new influx of residents, the infrastructure and ulities underneath these blocks are in dire need of an upgrade. As a DUMBO resident and a preservationist, I think this is a fine compromise. It’s going to fake, and it’ll look fake. But they have to remove them to put in the new sewer lines, etc. They are reusing the existing blocks, so I don’t think it will look fake. The only “fake” part is the granite bike lane. What would you propose that they put back, if not the exisiting blocks, to make it more authentic? The other option, which was the artificially weathered new blocks, looked much, much more fake and was really horrible. Kevin, have you come across any remaining Nicolson pavement during your travels? I sort of remember a small loading dock area between Vestry and Desprosses Streets in Manhattan that had a few square feet of this type of surface. The area is now razor-wired on both ends. My understanding is that this was a common pavement style in the 19th century and I’ve seen photos of Mercer Street getting the Nicolson treatment. 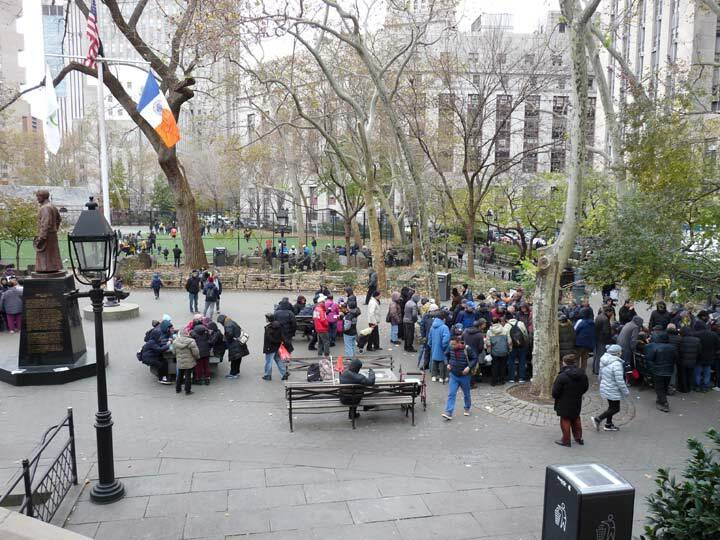 As a Brooklyn Heights resident for almost 40 years, the very concept of Dumbo is a joke, it’s a yuppie Disneyland version of a Brooklyn that never existed in the real world, 19th, 20th or 21st century. If Carrie and her GFs break their high heels on the cobbles, let them move back to the midwest where they belong! @ Jim, well put. They think they’re living the “‘urban” lifestyle. In the Forties folks moved to the ” burbs. They got a little house, some grass, and a fence. They called in the “country”. Today people move into areas that were once working areas, (now unaffordable to a native Brooklynite), buy a loft in an abandoned warehouse or brownstone, put in a Starbucks, over priced chi-chi restaurants, with their nannies, and call it the “city”. Urbanization in the 2000’s is what suburbanization was to the 1950’s. Dumbo is to the city what Forest Hills is to a forest. BTW, some of the sidestreets in Sunset Park still have the blue bricks. They’ve a history all their own. They should really keep these Belgian blocks especially when not too many of them are left in NYC. This document by the NYCDOT says it all. Yep, they do want to replace the Belgian blocks, presumably because they want bikeable streets (though these blocks are fun to look at and drive along). But yes, one can break his neck walking and biking over the old ones. And when it rains they get very slippery. Here in Antwerp had a nasty slides with my bike because of that. Call me DUMB but I have never heard of an area in NYC named DUMBO. I am a staunch preservationist and I know that anything the city says is a “better substitution” someone with city government connections is going to make a killing financially, costing the taxpayer even more than they are already burdened with. This article should have clarified the specific areas that are being targeted. You are right, anything that the city is “considering” is a done deal and as always we have to accept their judgments as though only they know what we really want.